VATICAN CITY, DEC.20, 2012 .- Pope Benedict XVI received His Eminence, Cardinal Angelo Amato, Prefect of the Congregation for the Causes of Saints in a private audience this morning. Following the meeting, the Holy Father authorized the decree regarding over 30 Blesseds, Venerables, and Servants of God whose causes are currently moving forward. 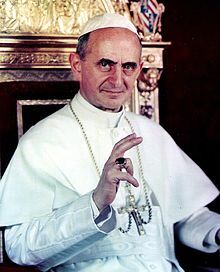 Among the most notable is the Decree of Heroic Virtue of the Servant of God, Pope Paul VI, who died at Castelgandolfo on August 6, 1978. Eight miracles were recognized including those of Italian martyr Blessed Antonio Primaldo and companions (Italy), Blessed Laura of Saint Catherine of Siena (Colombia), Venerable Giuseppe Gabriele del Rosario Brochero (Argentina), and of Venerable Sofia Czeska-Maciejowska (Poland). The martyrdom of several were acknowledged including the Servants of God Miroslav Bulešić (Croatia), Jose Saverio Gorosterratzu and 5 Companions (Spain), and Melchiorra del Adoracion Cortés Bueno and 14 Companions. The martyrs of Spain died for the faith during the Spanish Civil War in 1936. Pope's Message "Blessed are the Peacemakers"